The Southwest District boys basketball sectional tournament pairings were held Sunday. 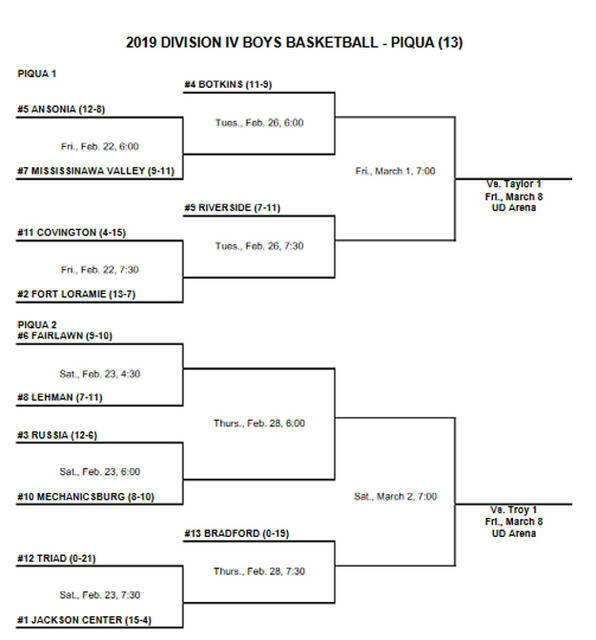 The Piqua boys basketball team, 6-14, received the 19th seed. The Indians will open play at 7:30 p.m. on Feb. 22 at Trotwood High School against top seed Centerville, 14-5. The winner will play 16 seed Northmont, 6-13, at 7:30 p.m. Feb. 26 at Centerville High School. The sectional title game will be at 7 p.m. March 1 at Centerville. 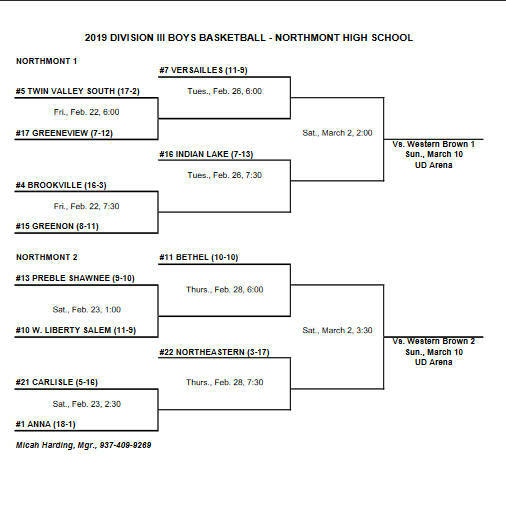 The Versailles boys received the seventh seed in the D-III Super Sectional and will play at Northmont High School. The Tigers, 11-9, will play the winner of fifth seed Twin Valley South, 17-2 and 17th seed Greeneview, 7-12, at 6 p.m. Feb. 26. The sectional final is at 2 p.m. March 2 and fourth seed Brookville, 16-3, is also in Versailles’ half of the bracket. Houston, 5-14, received the 20th seed in the D-III Super Sectional and will play at Butler High School. The Wildcats play second seed Stivers,15-4, at 3 p.m Feb. 23. The winner will play 23rd seed Dixie, 0-20, at 7:30 p.m. Feb. 27. The sectional final is at 2:30 p.m. March 2. Covington, Russia, Lehman Catholic and Bradford are all playing in the Piqua D-IV sectional at Garbry Gymnasium. Covington, 4-15, is in the upper bracket. 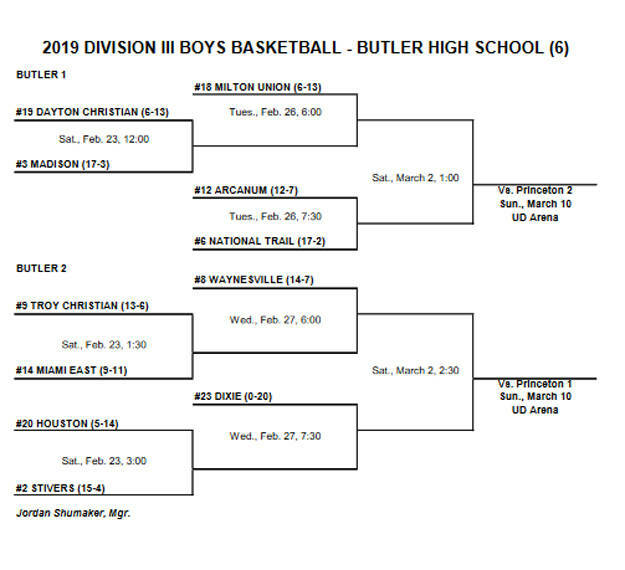 The 11th seeded Buccs will open play against second seed Fort Loramie, 13-7, at 7:30 p.m. Feb. 22. The winner will play ninth seed Riverside, 7-11, at 7:30 p.m. Feb. 26. The sectional final is at 7 p.m. March 1 and fourth seed Botkins is also in that half of the bracket. Russia, 12-6, received the third seed, Lehman Catholic, 7-11, received the sixth seed and Bradford, 0-19, received the 13th seed and all are in the lower bracket. On Feb. 23, Lehman will play sixth seed Fairlawn, 9-10, at 4:30 p.m., followed by Russia and 10th seed Mechanicsburg, 8-10, at 6 p.m. The winners will play at 6 p.m. Feb. 28. 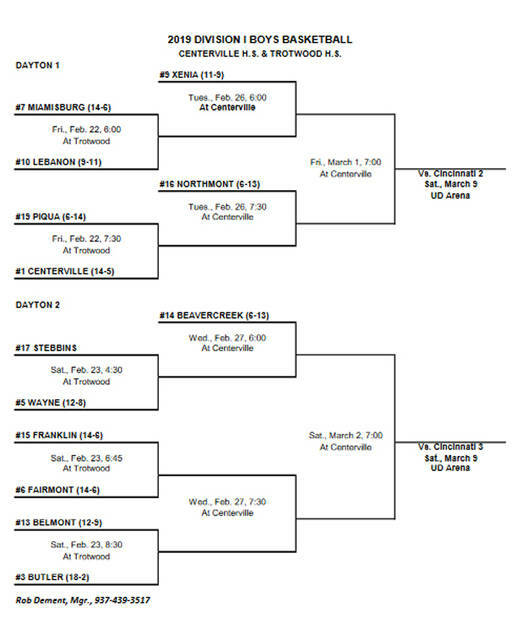 Bradford will play the winner of 12th seed Triad, 0-21, and top seed Jackson Center, 15-4, at 7:30 p.m. Feb. 28. The sectional final is at 7 p.m. March 2.